Thaw out the Pepperidge Farm Puff Pastry on a large board. Working one sheet at the time, with a rolling pin expand out until ½ the thickness by rolling it on both directions. Fold lightly in half by slightly pressing on the folded edge. Re-flatten the puff pastry and cut alongside to separate the dough. In a bowl mix together the rosemary and all the cheeses until well mixed. Place half of the content on the half sheet. Press gently in. Place the other half over it and roll the rolling pin over a couple of times. With a brush, brush some of the egg white all over the dough that is facing you. Cut lengthwise strips ¾ of inch wide. Bake for 10 to 15 minutes or until golden brown. Remove and let cool off. Proceed with the second sheet of puff pastry doing the same as above. 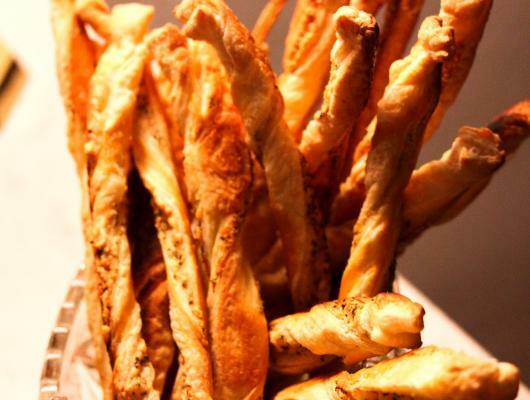 It is always nice to have in our repertoire easy appetizers to be able to make in a minute notice. 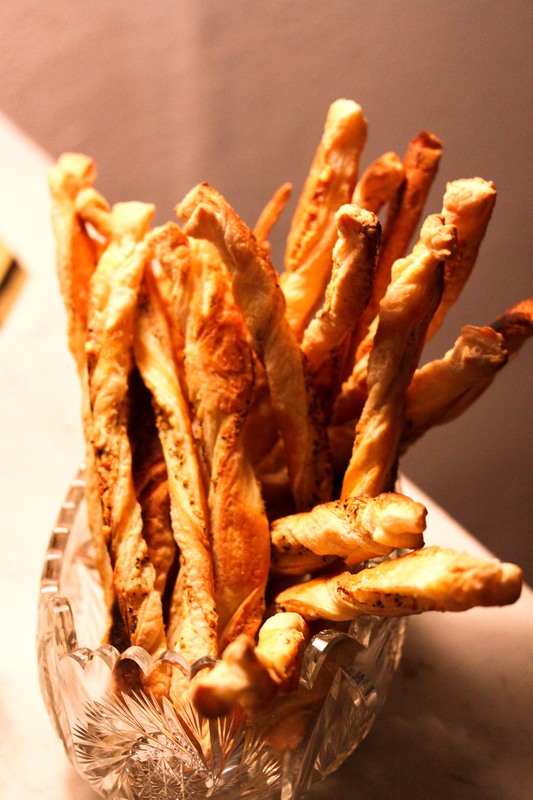 Those Cheese, Rosemary Breadsticks is just that. A perfect last minute treat. And with Valentine’s Day just around the corner, a great way to celebrate with your special person, family and friends. Easy to make, you can make it the night before, store and serve when needed. We recently had a party at our house and we placed a few glass container next to the Champagne and drinks for peoples to nibble on.